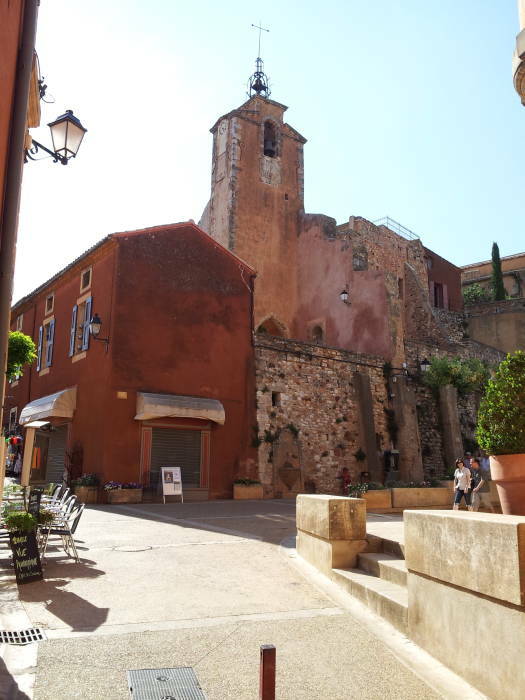 Roussillon is a small town on a hilltop in the Vaucluse département, near the larger town of Apt and the hilltop village of Gordes. 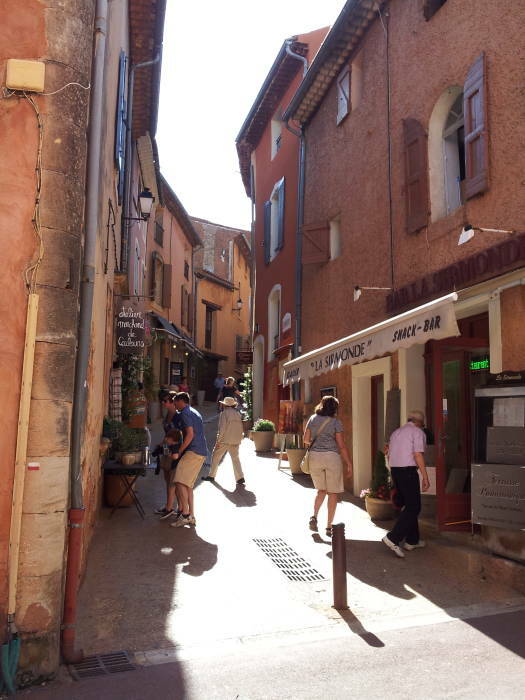 Gordes is more famous, or at least it's the hilltop town where you see several large tourist buses parked. 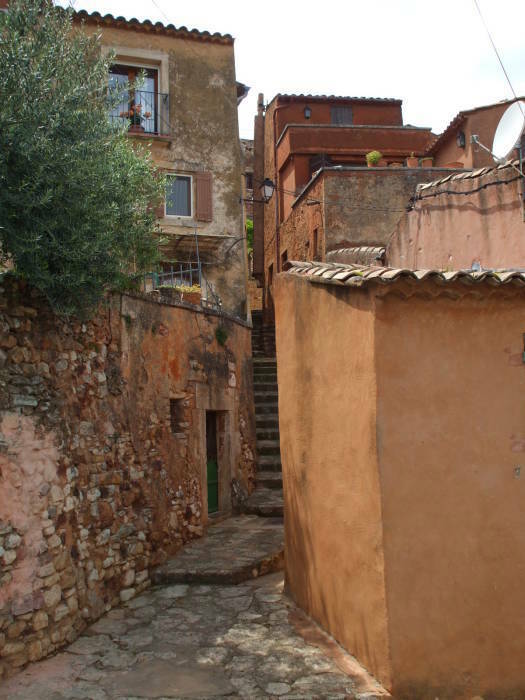 Roussillon is much less crowded, and its natural ochre deposits make the entire town like a beautiful painting. About 1,300 people live here, and the whole town is warm shades of yellow, orange, red, and brown. 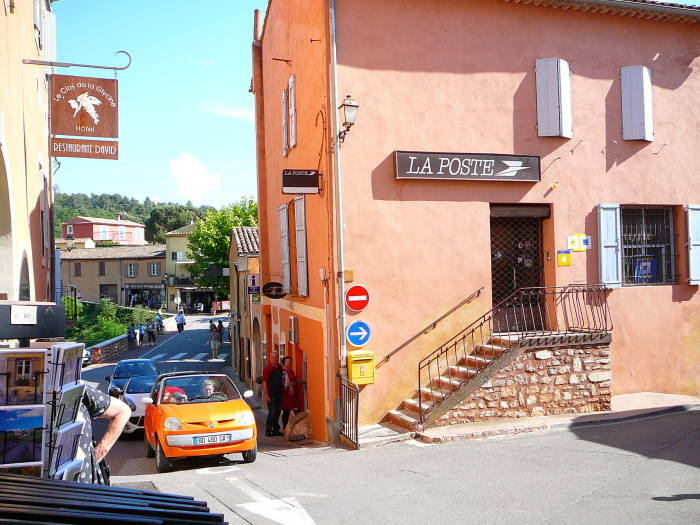 You will need your own car to visit Roussillon and the nearby Roman bridge Pont Julien. Take the D900 highway west from Avignon. It's marked as highway 100 on the older map below. 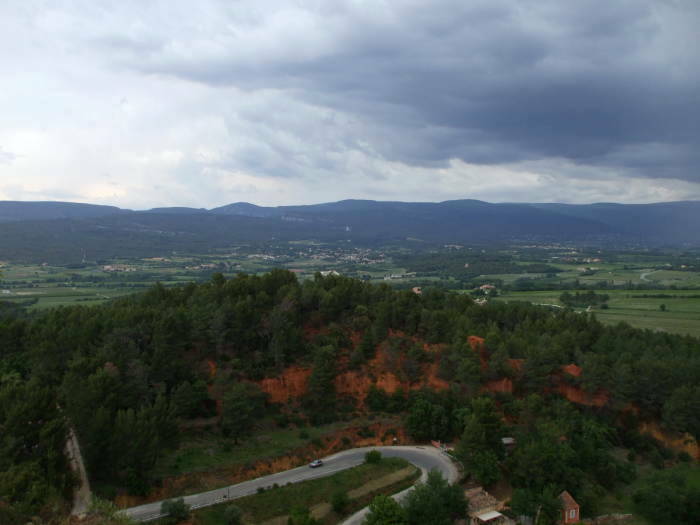 The Vaucluse is the broad valley leading east from Avignon, with the D900 highway from Avignon to Apt running down its center. 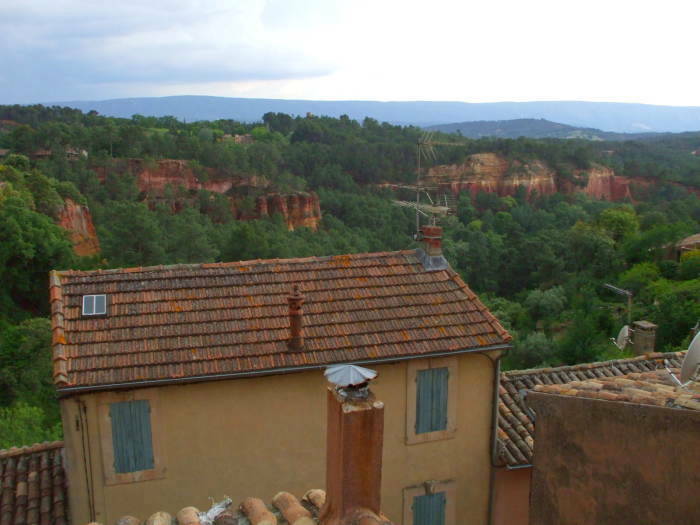 Roussillon and Gordes are prominent hill towns toward the north side of the Vaucluse. 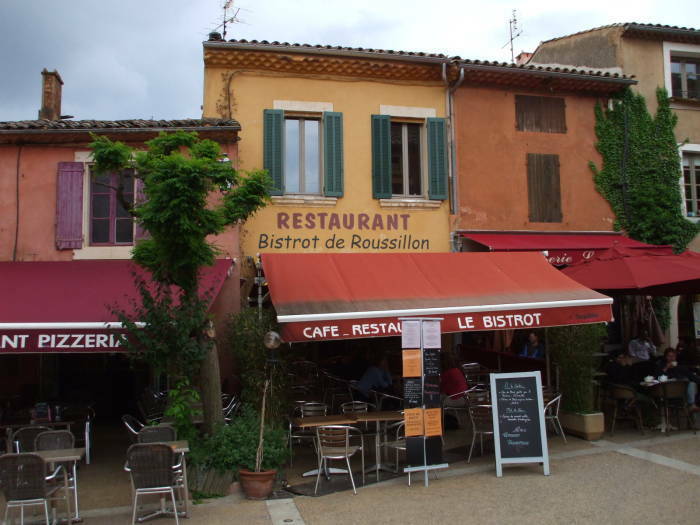 Roussillon is marked with a red bar in the wide map above. and it can also be seen in the map below. 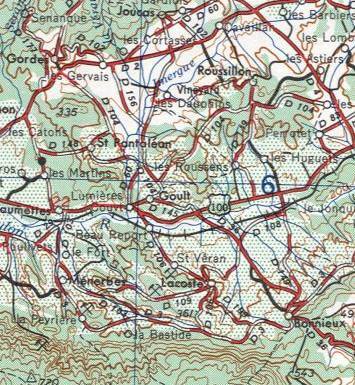 Roussillon is about halfway from the center to the northeast corner of this map. Pont Julien is south of the blue number "6", between the highway marked 100 (the D900 today) and the rail line. This is part of map NK-31-3 from the Perry Castañeda Library Map Collection at the University of Texas. 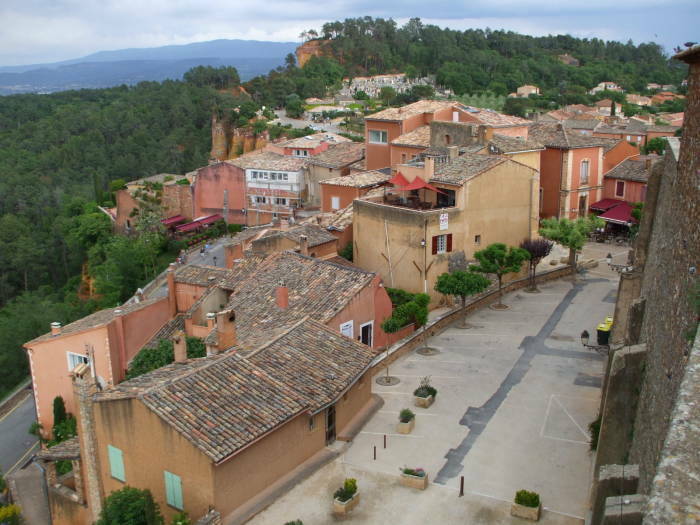 The Luberon Massif lies along the south side of the Vaucluse, with elevations up to 1,129 meters. 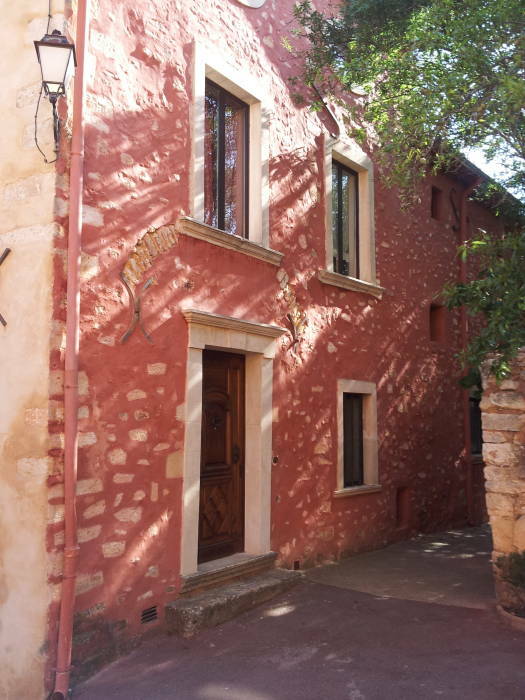 The towns of Ménerbes, Lacoste, and Bonnieux are low on the slopes of the Luberon Massif. 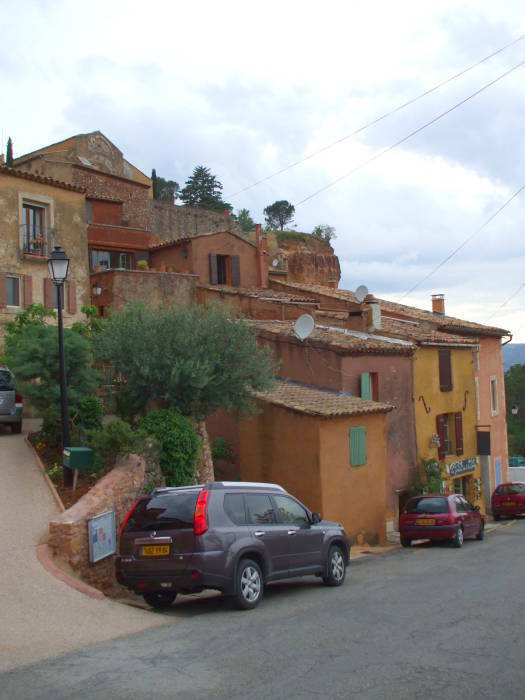 Roussillon is on an isolated hill within the broad valley. 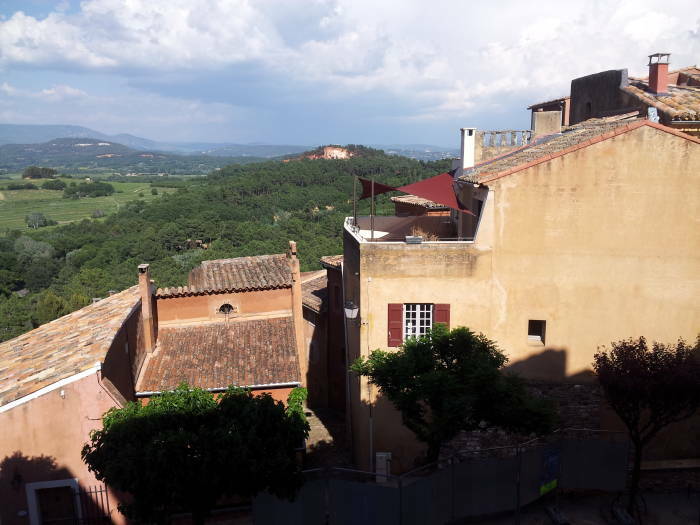 In the first picture below, we are up on a high point in Roussillon looking to the north, overlooking the D169 road winding its way up to the town. Ochre is a natural earth pigment containing iron oxide. To be informal, ochre is rusty soil or clay. You could find some iron oxide in most any soil, but if it's a high enough concentration you can use the material for pigment. It's non-toxic, and can be used to make a good oil paint. The name comes from the Greek ώχρός, meaning "pale yellow". 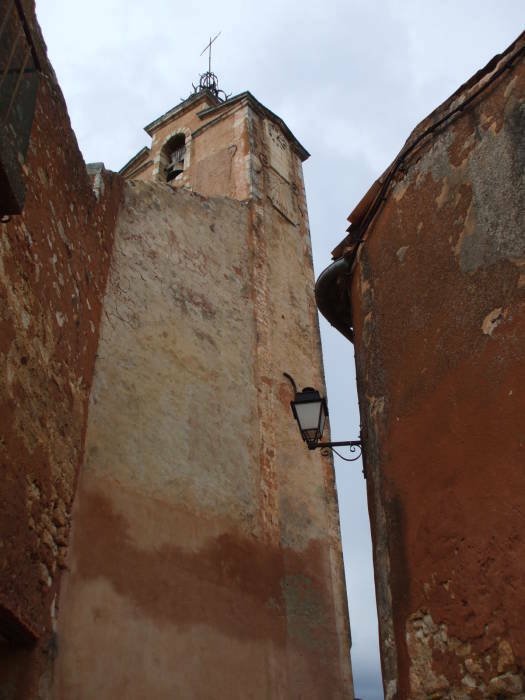 Roussillon is in an especially ochre-rich area. There are exposed outcroppings of ochre, and the town itself is mostly shades of yellow, orange, and red. A local scientist found an efficient way of extracting the pigment in the late 1700s. The textile industry was increasing its use of pigments, and ochre processing became the main local industry. 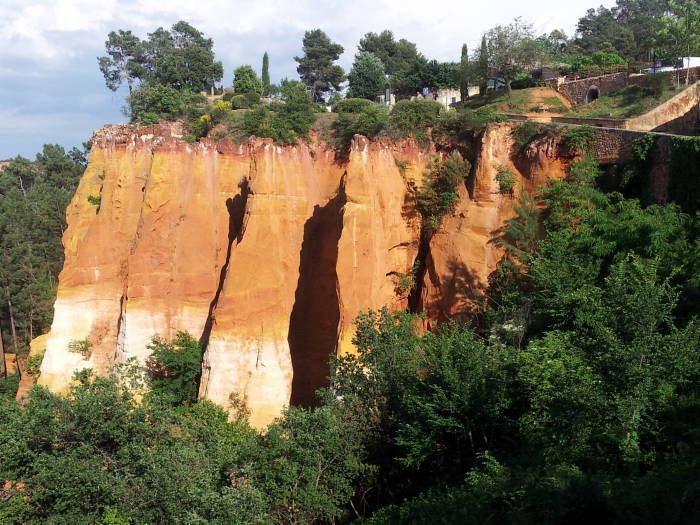 Several quarries and ochre processing factories were established around Roussillon. Thousands of people worked in the ochre business. The natural ochre business was good until about 1930, when industrial processes were taking over while global unrest decreased the market. Yellow ochre is limonite or hydrated iron hydroxide, FeO(OH)·nH2O. Red ochre is hematite or anhydrous iron oxide, Fe2O3. Purple ochre is chemically the same as the red, but its larger particle size changes the color. Brown ochre is goethite or partially hydrated iron oxide, FeO(OH). 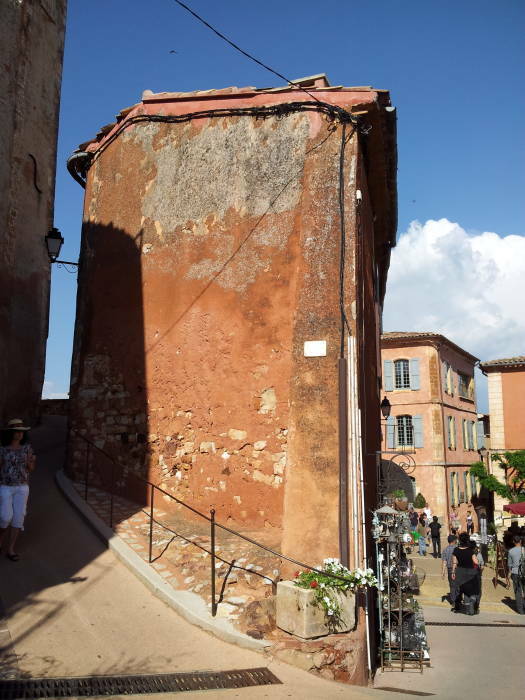 Sienna and umber pigments are limonite or yellow ochre blended with manganese oxide. Sienna has less than five percent manganese oxide, making it darker than ochre. Umber has five to twenty percent manganese oxide, making it darker yet, a dark brown. Burnt sienna and burnt umber come from heating natural sienna and umber, transforming some of the limonite into hematite and giving them more reddish colors. 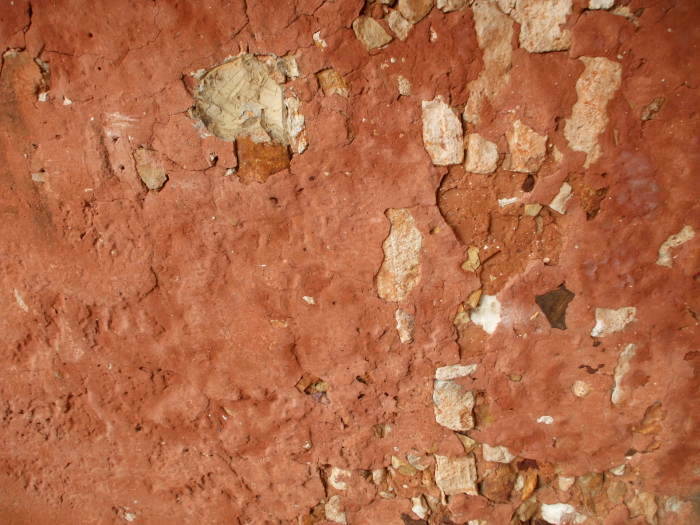 Red ochre was used as a pigment in Africa over 320,000 years ago. Paleoanthropologists found some ochre pieces carved with abstract designs dating back to about 75,000 years ago at Blombos Cave in South Africa. In the Rift Valley of Africa over 320,000 years ago, the earliest discovered Middle Stone Age blades and points were made from black obsidian and white and green chert, which the makers had to obtain from distant sources, possibly through trade networks. These significantly more sophisticated tools were associated with both red and black material. Scientists believe that these pigments were used to color their bodies or their spears. Neanderthals, who appeared 200,000 to 250,000 years ago, used ochre in burial rites in Europe. See, for example, this paper describing the burial of a child about 4 years old, dated to about 24,500 years ago. The references in that paper describe similar burials with pierced shells and ochre coverings in Britain, the Italian peninsula, and today's Czech Republic. In France, the Pech Merle paleolithic site has pictures of animals made with red and yellow ochre and dating back to about 25,000 years go. The Lascaux cave has a picture of a horse made with yellow ochre and dating back to about 17,3000 years ago. Also see this paper, which says: "The MSA [Middle Stone Age], roughly equivalent when it began some 300 thousand years ago to the coeval Middle Paleolithic (MP) material cultures of the European Neanderthals, shared with the latter various hints of growing complexity such as the long-distance transport of material and the increasing employment of ochre, almost certainly initially in functional settings such as disinfection or preserving hides." That cites a 2002 paper on the use of ochre in the Middle Stone Age in southern Africa. It goes on to say that about 100,000 years ago Homo sapiens in the eastern Mediterranean and both northern and southern Africa began using ochre in body ornamentation. This 2017 paper describes ochre use at Porc-Epic cave in Ethiopia, beginning around or before 45,000 years ago and "becoming particularly intense" around 40,000 years ago. The authors say "Our results identify patterns of continuity in ochre acquisition, treatment and use reflecting both persistent use of the same geological resources and similar uses of iron-rich rocks by late MSA Porc-Epic inhabitants. Considering the large amount of ochre processed at the site, this continuity can be interpreted as the expression of a cohesive cultural adaptation, largely shared by all community members and consistently transmitted through time. A gradual shift in preferred processing techniques and motions is interpreted as reflecting cultural drift within this practice. Evidence for the grinding of ochre to produce small quantities of powder throughout the sequence is consistent with a use in symbolic activities for at least part of the ochre assemblage from Porc-Epic Cave." Ochre of various colors was used by the ancient Egyptians, Greeks, and Romans. North American native people made red oil paint using ochre powder with seal oil, cod liver oil, and linseed oil. Ochre in the Middle Stone Age of Southern Africa: Ritualised Display or Hide Preservative? 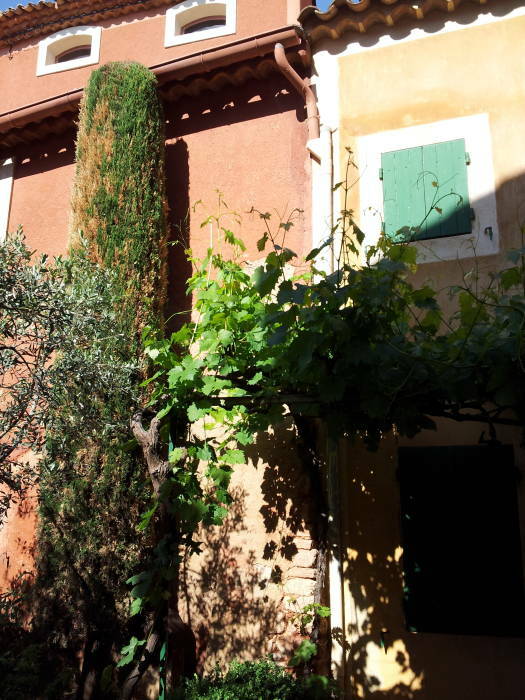 The scientist Jean-Étienne Astier lived in Roussillon. In the 1780s he developed a process for extracting and concentrating the pigment on an industrial scale. Start by extracting colored clay from open pits or mines. This original material is about 80-90% sand and 10-20% ochre. Next, wash the clay to separate sand grains from ochre particles. Pour the remaining mixture into wide basins to further separate sand grains from the ochre, then drain off the water. Dry the ochre, cut it into bricks, crush those, and then sift the powder. The resulting powder is classified by color and quality, with the best reserved for paint pigments for artists. 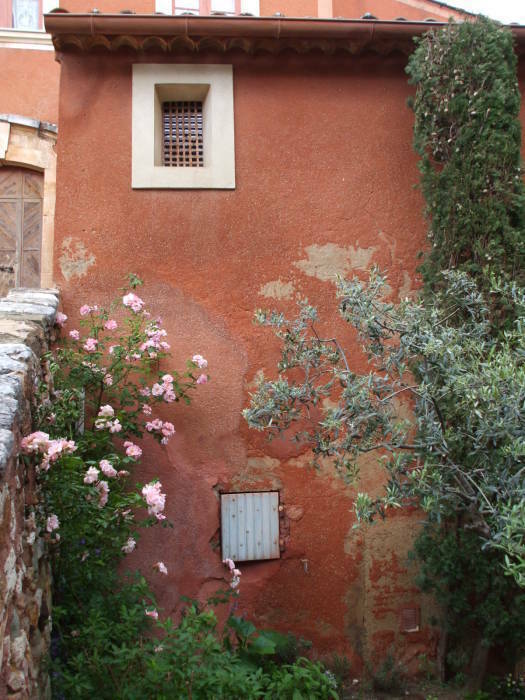 Roussillon ochre was exported around the world. It was used for paints, for textiles, and also as a component of industrial rubber during the early years of that industry. 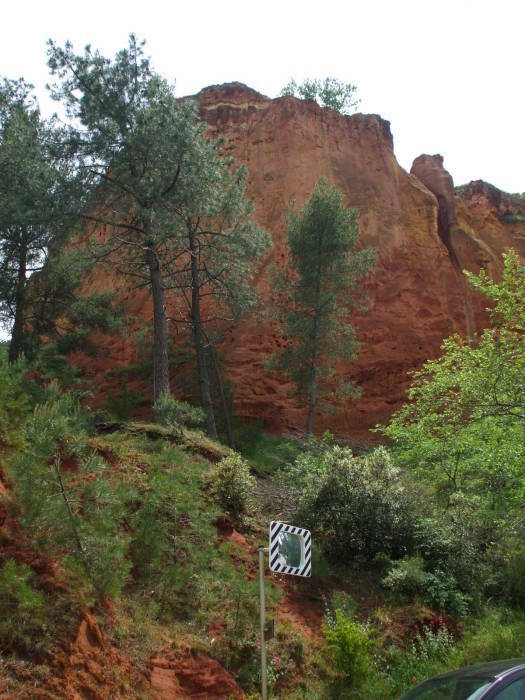 The ochre from Roussillon was an important export of the French economy. Then World War I, the Russian Revolution, and the Spanish Civil War brought abrupt ends to major pigment markets. At the same time, artificial pigments were being developed and produced on industrial scales. 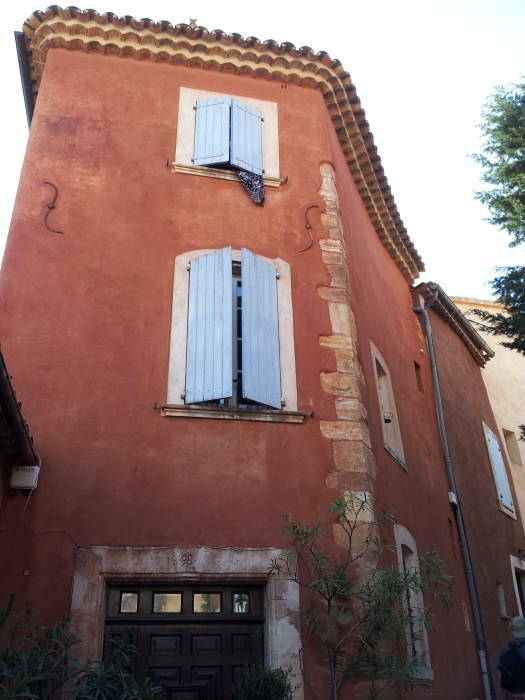 Production ended around 1930 in Roussillon. Now tourism is the main business in town, and agriculture is the main activity in the surrounding commune. 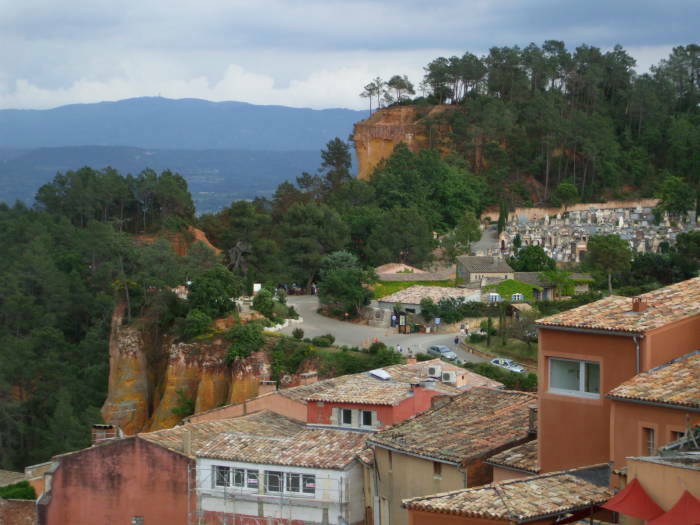 The D105 road passes north to south through Roussillon, while the D169 and D227 approach from the north. It's a small town. There is a parking lot but you may have to park below the town in the marked area along the road and walk up the last part of the hill. The hilltop was very likely occupied in Roman times, as the Via Domitia road from northern Italy to Iberia passed nearby. There was a small castle here by 987. 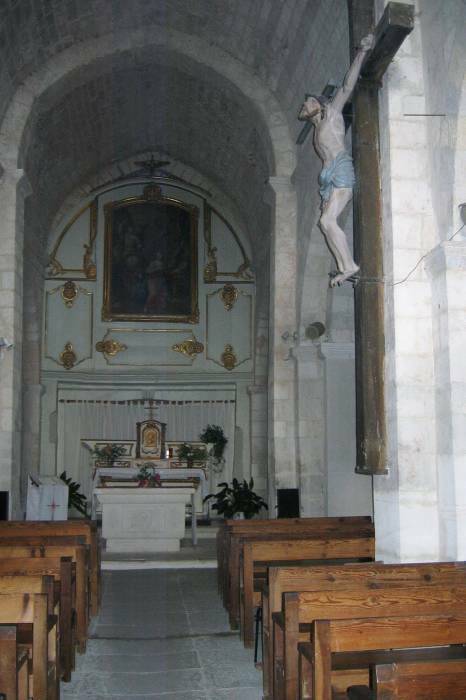 In the 12th century the Saint-André abbey of Villeneuve-lès-Avignon controlled the church here. 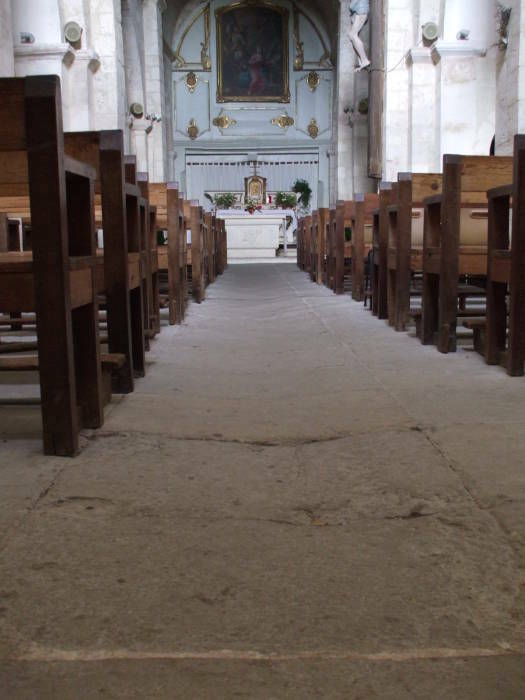 That abbey had been founded across the Rhône from Avignon in the 980s. The lanes wind up from the square at the Mairie or Town Hall, leading through an archway at the base of the belfry and clock tower. 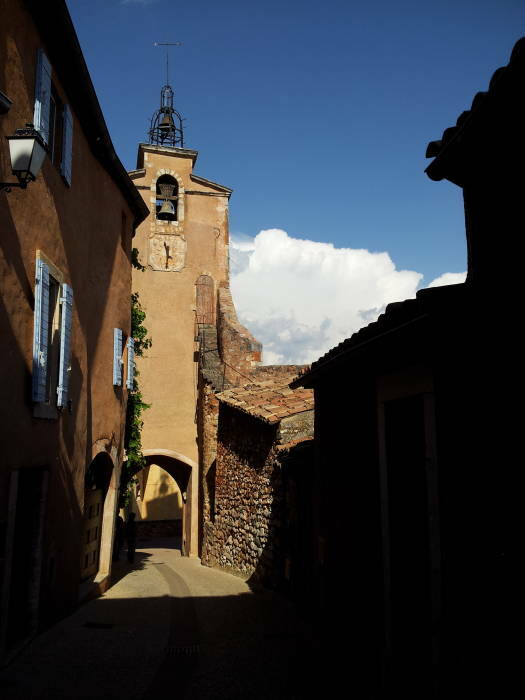 That takes you into the castrum, the fortified core of the old town at the peak of the hill. The castrum was originally the castle known in the late 980s. The writer Samuel Beckett joined the French Resistance in 1940 and worked for them as a courier. His unit was betrayed in August 1942, and he and his girlfriend fled from the German Gestapo on foot. They traveled south to Provence. 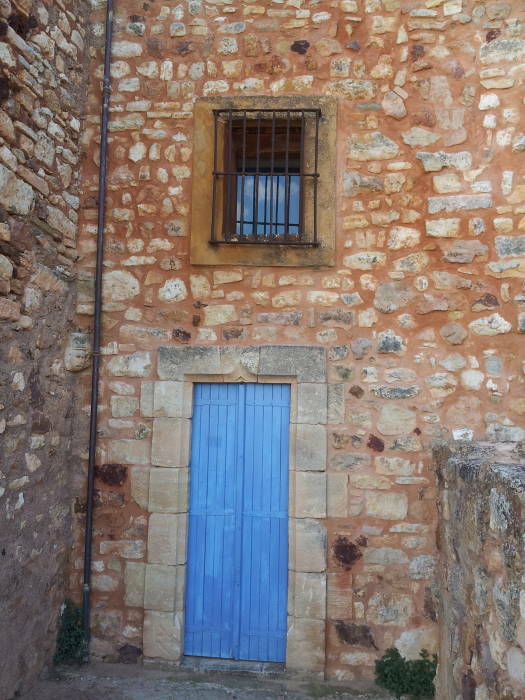 They went into hiding in Roussillon during the years 1942-1945. 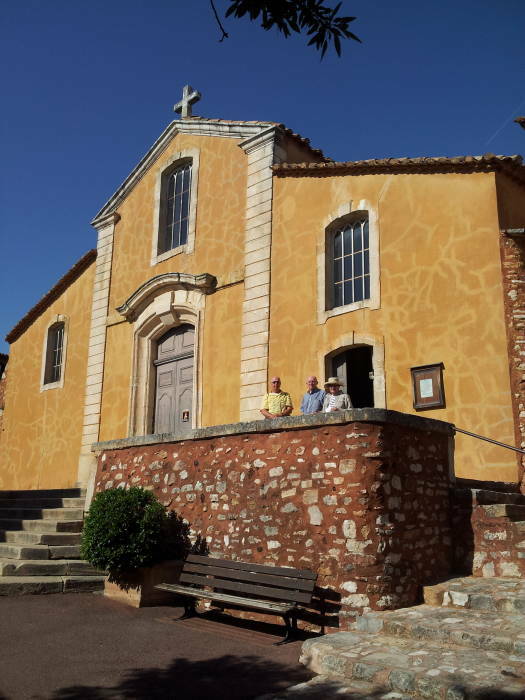 They stored munitions at their home, and helped the Maquis sabotage the German army in the Vaucluse during those years. The French government awarded Beckett the Croix de guerre and the Médaille de la Résistance for his service. He also wrote his novel Watt during that time, and his famous 1955 play En attendant Godot or Waiting for Godot mentions Roussillon. 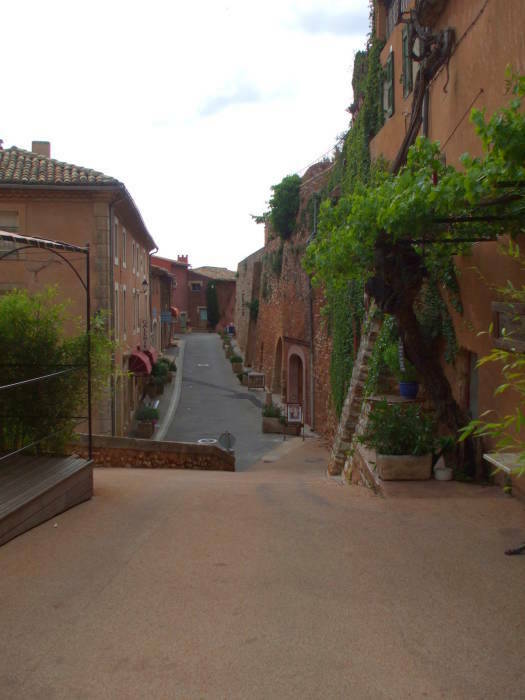 The American sociologist Laurence Wylie lived in Roussillon in 1950-1951. 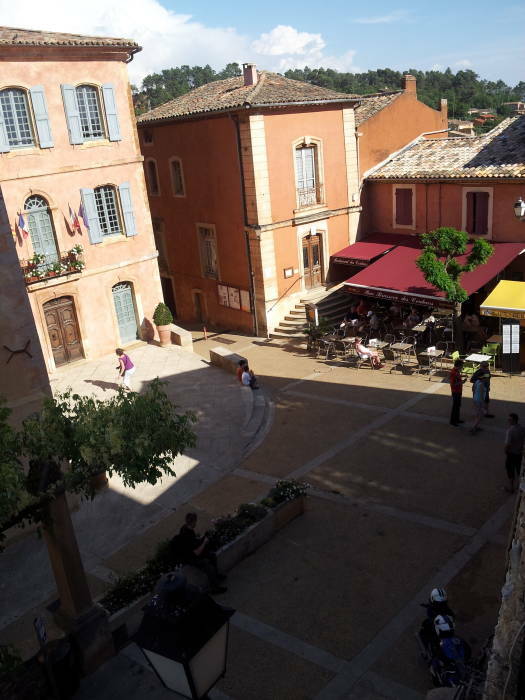 He published his now classic study Village in the Vaucluse, in 1957, refering to the town as "Peyrane." 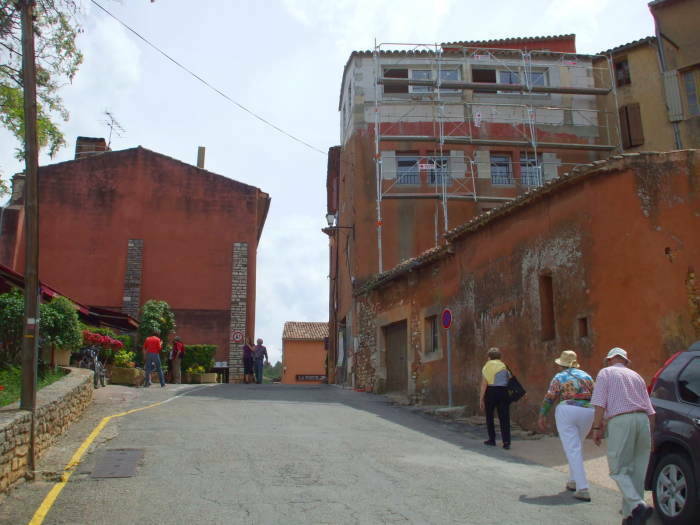 Roussillon's population was close to its lowest number in the modern era during the 1950s. Just 713 people lived there in 1954, and 702 in 1962. 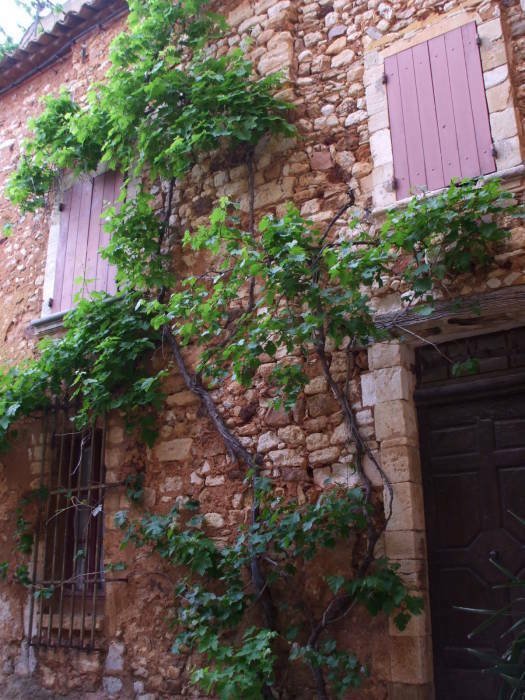 This was long before Peter Mayle made the Vaucluse famous with his 1989 A Year in Provence. The Church of Saint Michael is on the high point of the old town. Its origin dates back to the 11th century. The interior has a simple Romanesque barrel vault. The current façade is from the 17th century. 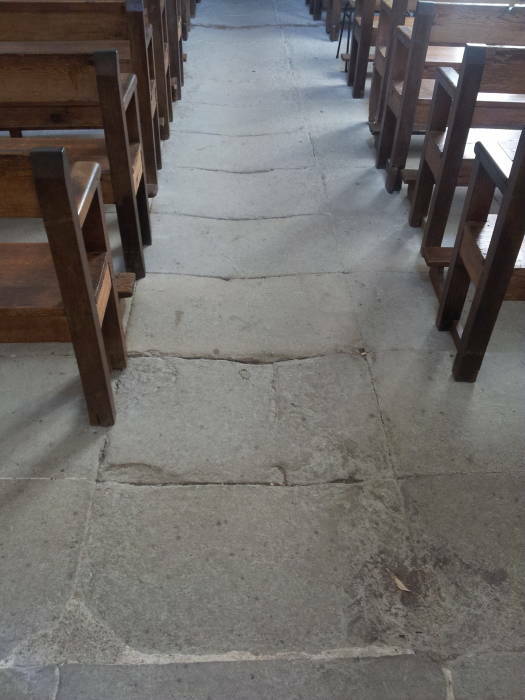 The church is so old that the stone floor of the central aisle is worn down into a broad, shallow groove. 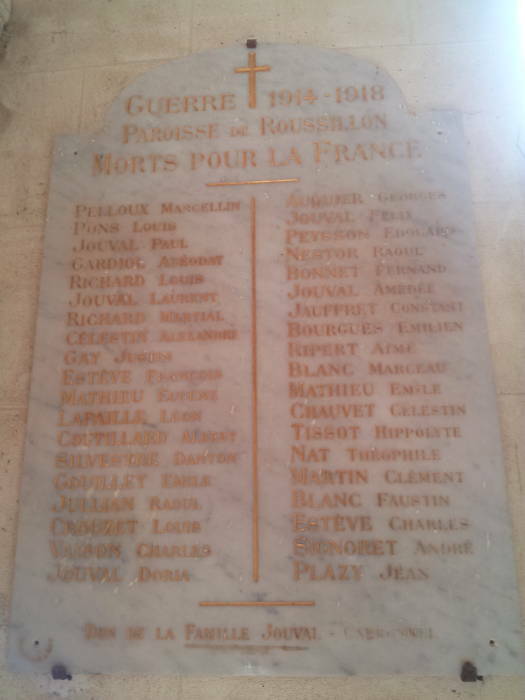 Like most places in France, the town lost several men in World War I. This plaque lists 38 men killed, out of a population of 1,103 in 1911 and 936 in 1921. Other ochre deposits are visible in the surrounding area. There are great views from the area around the church, as it's right at a cliff face at the top of the hill. 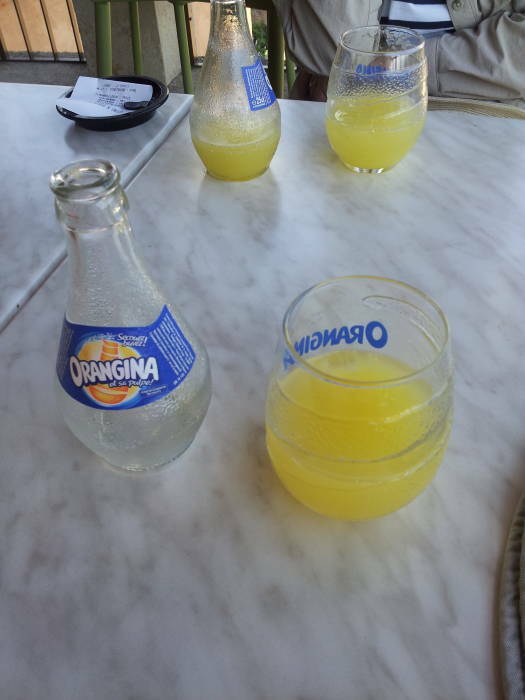 Relax with a refreshing Orangina at one of the many cafés. 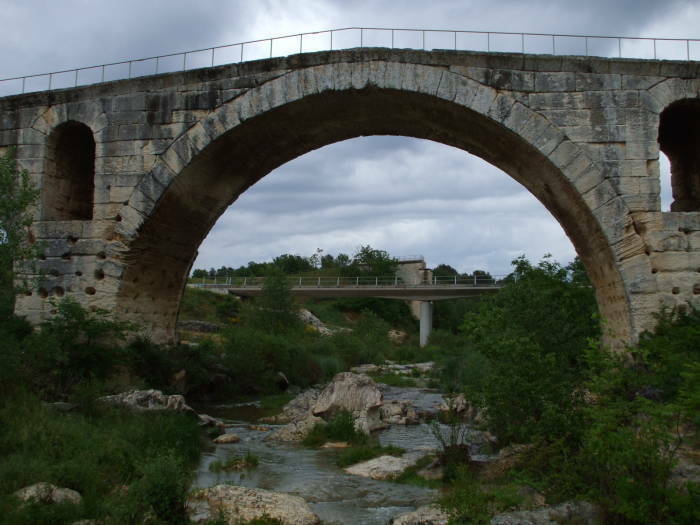 Pont Julien (French for Julian Bridge) is a Roman-era bridge over the Calavon river. It was built in 3 BC. It's 80 meters long, with a central span 46 meters long and 6 meters wide. 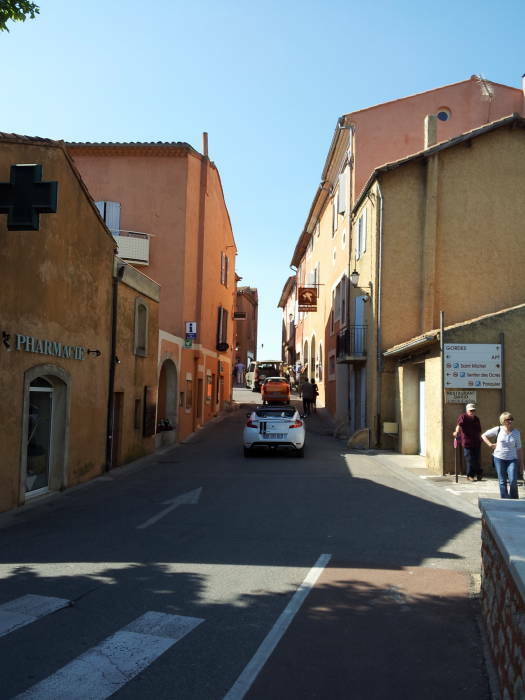 Go south from Roussillon, taking road D149 to D108. Stay on the D108 to cross the D900 highway. Pont Julien is just south of the D900. It's 5 km north of Bonniux and 8 km west of Apt. 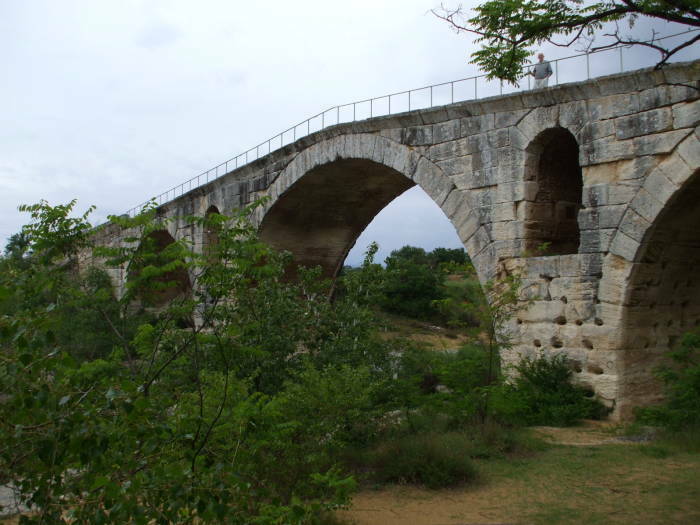 The bridge was originally part of the Via Domitia. This was a Roman road connecting Turin in Italy to Narbonne in the Roman territories in southern Gaul, and then continuing on to Hispania. This route was old when the Romans updated and paved it, following the mythic route of Heracles. 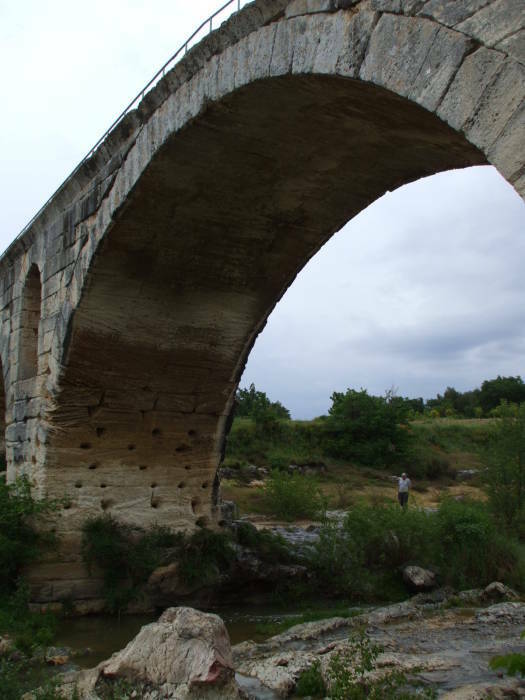 The semicircular arches were built from large limestone blocks from a nearby Luberon quarry. 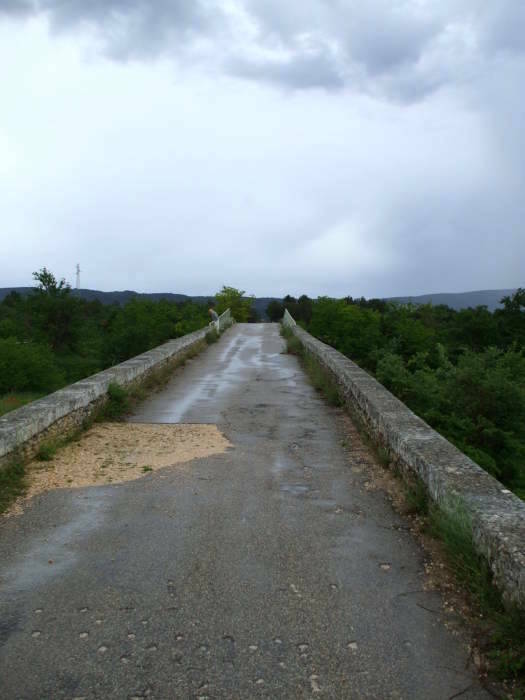 The bridge was used for auto traffic until 2005, when a new bridge was opened for vehicular traffic. The supporting columns have openings that allow floodwater to pass through, reducing stress during especially high water. 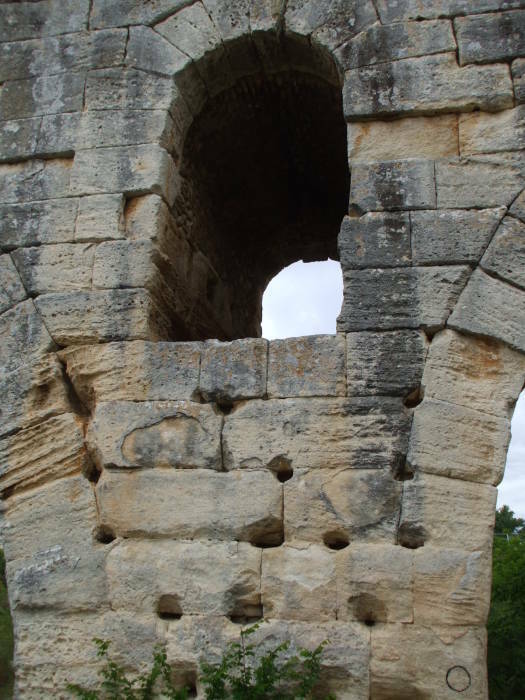 It was used continuously for just over two thousand years, so the design certainly worked.